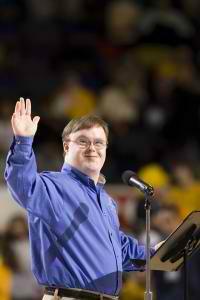 It was 2008 when John Franklin Stephens, who has Down syndrome, wrote those words, but their importance has not diminished in the four years that have passed. A Special Olympics athlete and global messenger, Stephens recently had to once again defend his humanity—and, it seems, the world is listening. What Stephens did is admirable. While Coulter’s comment surely enraged him—and many others—he responded with maturity, poise, and intelligence. It would have been easy to reply in the heat of the moment, lashing out at Coulter, thus sinking to her level. Instead, Stephens acted with the utmost dignity. He was forward and brave with his words, laying blame where blame was due. But he was also honest, sincere, and sensitive, explaining exactly how using the word “retard” as an insult hurts him so much. The letter is both heart wrenching and heartwarming, outlining how Down Syndrome has affected and shaped Stephens’ life. “I get the joke — the irony — that only dumb and shallow people are using a term that means dumb and shallow,” Stephens wrote in his 2008 Denver Post piece. “The problem is, it is only funny if you think a ‘retard’ is someone dumb and shallow. I am not those things, but every time the term is used it tells young people that it is OK to think of me that way and to keep me on the outside.” And that’s the real shame. Because if anyone deserves to be excluded, it’s Coulter.